Home / Articles / HEY TOM CRUISE! My name is not “Tom Cruise” I am a real person with a real name trying to make a real living. We don’t go to your work and make comments to you while you are working so we don’t expect to hear it from you especially if you don’t know are name. In the movie “Cocktail” the Flair bartenders in the movie seemed to spill almost everything in sight. Now a true Flair bartender takes pride in his craft and spilling the profits is unacceptable. A stigmatism that we have finally proven wrong. Proper Flair bartending can be done without spilling. For the movie though the director just thought it looked better having the bottles spraying out alcohol while they were flipping them. So by comparing us to the movie “Cocktail” you are unknowingly insulting us and saying we can’t do our job properly. 1. They want to look cool by yelling and attracting attention to themselves and at the same time put you down for doing something you love. 2. They like and appreciate what you are doing and are trying to relate to you with something familiar and something you both have in common. This is hopefully the main reason for this comment. Everybody wants to feel accepted and especially by one of the coolest people in the room. I mean lets face it; everybody wants to be the bartender’s friend. Free drinks, great service, meeting people, special privileges, etc… the list goes on and on. Perhaps when some people see Flair bartending their first memories that they can relate to it is the movie “Cocktail” with yep, you guessed it “Tom Cruise”. 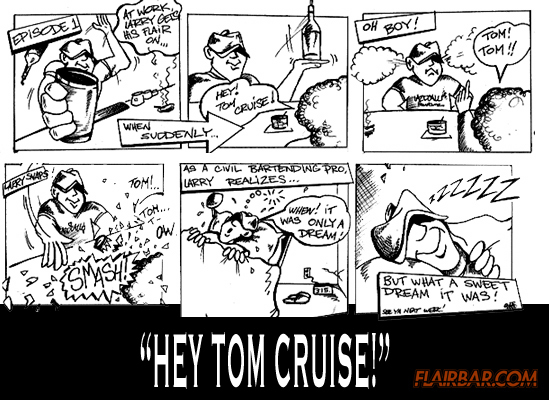 In case you haven’t noticed yet many Flair bartenders don’t care for the comment “Hey, Tom Cruise…” but we still know we can’t escape it just yet. One good thing that we have noticed over the years. The comment “Hey, Tom Cruise…” is being replaced with “Hey, I saw that on T.V.” or “Hey, I saw that in Las Vegas”. Now people have something else to compare it to besides the movies “Cocktail” and “Coyote Ugly”. 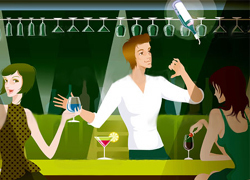 The popularity of our sport of Flair bartending has grown tremendously over the last couple of years and with this growth came new exposures in media. A&E, The Travel Channel, MTV, CMT, GAC, CBS, etc… Now people have more choices to have something to relate to you with rather then the old movie “Cocktail”… and these new exposures portray our sport in a more realistic and positive way so we welcome these comments more then the old “Hey, Tom Cruise…” comments.